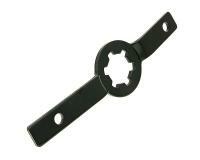 This is a specially made Variator locking tool for blocking the variator during assembly and dismantling. Easy handling makes work fast and professional. The tool is simply placed over the teeth of the Kickstarter carrier and fixed into the two long holes with a screw or bolt on the engine housing. The variator nut can then be easily secured or loosened. Unfortunately, the required screws or bolts are not included and have to be ordered separately. 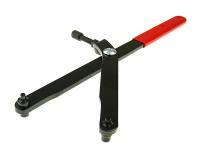 This tool is best suited for working on the drive system as a piston stop. This removes the risk of damage to the piston. Fits CPI, Keeway, Generic, Mawi Motors, as well as other brands use a 2-stroke Minarelli-based Chinese-built engine.